This little board is a scanner of up to 32 contacts, translating their closings into MIDI notes. In addition it can take one analog input, like potentiometer, to add one Continuous Controller like swell or volume. Typical application is MIDI controller for pedalboard in organ consoles, where it can take 32 keys and swell pedal. The board shown above has 12-way socket to be plugged onto typical 0.1'' spacing pin header. If you wish, there's possibility to solder a cable or another header at the bottom side, where 12 soldering holes are provided. This is for 4x8 diode matrix. 3 pads on the side are for the potentiometer, and 3-pin at the bottom connector for MIDI output. Proper cable with DIN5 jack is supplied with the board. Four rectangle pads at bottom edge are for soldering wires to power supply (+ -) and momentary button to enter user settings (SET). The "SET" button alows the user to change every settings of the controller, like MIDI channel, split, or the type of controller assigned to the potentiometer. 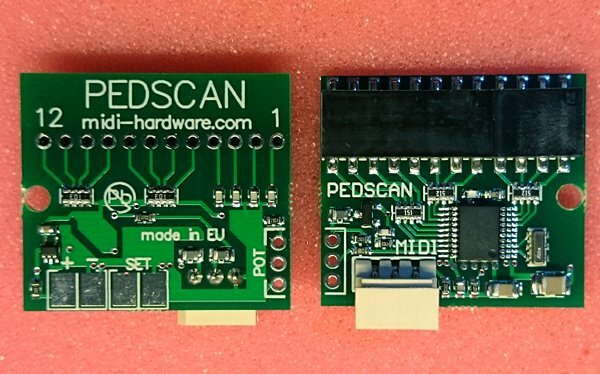 PEDSCAN is designed to be held in place just by the means of 12-pin header, but if needed, there's small hole of 2.5mm diameter at the edge, so the board can be attached to something by very small screw. Watch out not to short anything on PEDSCAN board with the screw. all settings stored in nonvolatile memory. requires 5-12V DC power supply, about 1mA current consumption.